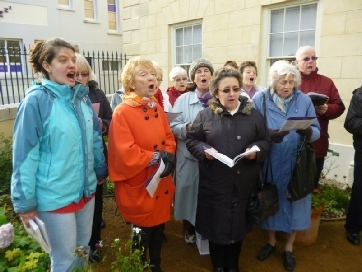 Saturday 15th December 2012; The choir sang in 16 New Street- a newly refurbished heritage property managed by the National Trust (we sang inside when it was raining but thankfully it held off the majority of our time and we managed to sing in the court yard for the most part). See pictures below. 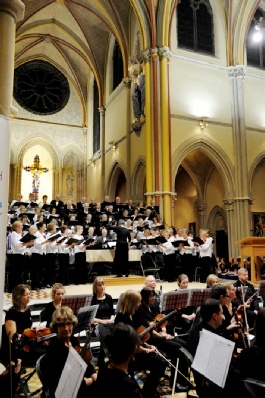 The Festival of Carols was once again a great success with people arriving an hour before the start to be sure of a good view. "Last Wednesday, December 19th, marked what many in the Island feel to be the beginning of Christmas. 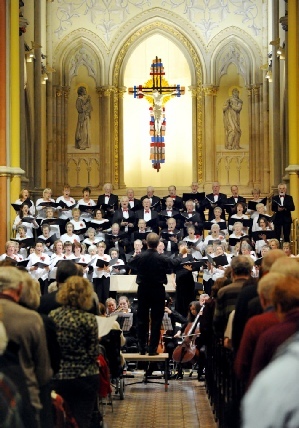 It was the annual Festival of Carols at St Thomas’ Church. It was one of those traditional events with a spicy modern flavour which delighted the 700 or so members of the faithful audience who braved wind and rain to be there. Not only were they amazed and delighted by the varied and seasonal fare, but Victim Support, the Charity selected for this year’s collection, was equally uplifted by their generosity -£2,420 in these hard time was a marvellous response. Journey preparing us for Christmas itself. The applause which had been building up for 55 minutes was finally released and echoed repeatedly around the superbly lit and decorated vaults of this great musical and spiritual venue. Orchestra players, choir members and audience shared n many tears of sheer joy and what had been achieved. 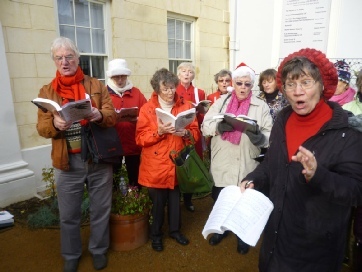 The hosting Jersey Festival Choir were in fine harmonious and varied voice , with Elizabeth Farnon’s subtle selection of carols allowing explosive joy in the opening “Make we joy now in the fest” to be tempered by the lilting notes of Kenneth Leighton’s “Lulla, Lulla thou little tiny childe”. This was enhanced by the soaring and searing soprano voice of the soloist, Vivienne Hassell. The Holmchase singers, conducted by Angela Luce, were as usual, the most accomplished of the musical performers. 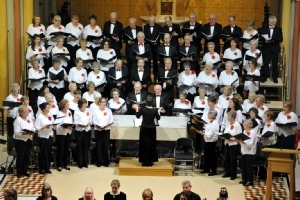 Their version of “A Chrismas Blessing” by Philip Stopford was one of four brilliant jewels in the musical mosaic of the evening. “Acapella Brass” entertained us before the service, but also kept us in the Christmas spirit with their harmonies from on high in the Organ Loft. Not to be outdone by these breathtaking and lung-demanding sounds, Malcolm Wittel made Bach ‘s version of “Wachet Auf”, so well known as a vocal piece, uniquely enjoyable in its tuneful variations. For sheer delight in another variation of a well-loved theme, this time “Jingle Bells”, the Orchestra were at their convivial best in Marshall Ockers’ arrangement, with the strings plucking at the tinkling sounds with verve! Everyone left the experience deeply moved, and believing in the power of music, especially at Christmas time, to harmonize and heal a world that so often seems broken and past mending. Warmest thanks are due to Monsignor France for again allowing us to use his superb Church, to all those who worked behind the scenes to make the evening possible, but especially to the audience for coming and joining us in the celebration."